The Mariners would never lose a game to the Netherlands again! Has a nice ring to it. 4 games left and the Mariners are 1 game up on Washington for the honor of shelling our $8 million or so to Strasburg. Can't wait to see how they talk themselves out of picking him 1st. Much better to spend that money on Washburn. Washington's 2 hottest hitters, Zimmerman and Guzman, were out with the "flu" yesterday. Guzman is back in the pregame lineup today, but the hard hitting Zimmerman is out again tonight. M's need both of them in there this weekend if the Nationals want a shot at winning a game @PHI. Moseley? Come on. Are they even trying? Another must-lose situation for the Mariners. The Log was on-hand for one of the Mariners' most efficient losses of the season. It only took a couple of hours for Seattle to pull a full game ahead in the Strive for Strasburg! Fun times were had by all. Analysis: CRAFTY move by Washington to drop the three game series vs San Diego. They are now the owners of the 2nd longest losing streak in baseball (5 games). The Mariner free-fall has reached 11 and counting. Mariners: 4 games vs. the AL powerhouse Angels, and then finish up with 3 against the A's. Prediction: 2-5. Tonight's loss is critical for the M's. Santana comes in with a chance to show in the CY Young balloting. Win tonight and the M's are locked up with Washington. A loss puts them a full game ahead and in the driver's seat. Nationals: 3 vs. FLA and then on the road to finish up with a 3-game-set @ PHI. Florida's season is over, so the Nationals have a shot at a game or two there. Too early to tell if Philly will be playing for anything, but you have to like their chances for a sweep there. Prediction: 2-4. Padres: @LAD for 3 and then back home for a 3-gamer vs. PIT. San Diego has to lose all 6 games to have a shot at Strasburg. Prediction: 3-3. The Mariners have to lose tonight. If they can find a way to drop their next 3 games it would be very difficult for Washington to make up that ground. The Mariner Log staff will be at Safeco all week tracking their progress. KANSAS CITY -- The bad news for the Mariners is that left-hander Erik Bedard is expected to require six to nine months of rehabilitation following his exploratory shoulder surgery on Sept. 26. The good news is that Seattle is developing a cluster of young starters in the waning days of this season who have the potential to bolster the rotation early next year. The real news here is that Bedard hasn't pitched since July 4th, and they are finally scheduling elbow surgery for September 26th. Those 2 1/2 months likely mean he will start the season on the DL rather than being ready for spring training. To be fair, medical issues like this are rarely black and white and there are probably legitimate reasons why the team and Bedard waited this long. 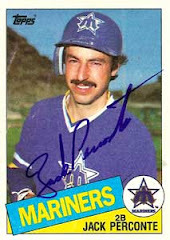 Had he been able to come back and make a start or two it would have gone a long way to help the Mariners deal him for two buckets of baseballs in the offseason. At this point one bucket seems like a stretch. The other takeaway from that first paragraph is the "cluster" of young starters the Mariners are developing. Developing into what? Team ERA in August: 5.78. Team ERA in September: 5.40. The Padres and Nationals, both 3-7 over their last 10 games, kickoff a three game set tonight. Tough to know what to root for there. The Mariners need to take care of business and drop the series in Oakland. A clean sweep would put them at 11 losses in a row. Just what the doctor ordered. Unfortunately they send Felix to the mound vs Eveland tonight. Big mistake. The key tonight is to have Felix cover home and 1b a few times early. That should ensure an early exit and put the M's on-track for #10. Never mind that the M's still haven't signed their 2008 first rounder, Josh Fields. I totally understand the Mariner position on the Fields situation. Boras is holding them hostage for an extra $500K that they don't want to spend. BUT...had they forked over the $500K (which is basically one Carlos Silva start) they would have a better idea of what they have in Fields and potentially be in a position to deal Putz in the offseason for a young power hitter and slide Fields into the closer role for 2009. If they find a suitor for Putz this offseason we could be looking at Batista at the back end of the bullpen to start 2009. Back to Strasburg...maybe they can get a package deal from Boras for both pitchers if they finish with the worst record? Either way it gives Mariner fans something to root for at the end of a horrible season. REFUSE TO WIN! Strasburg is just getting warmed up.